Having trouble finding the perfect night golf tournament package? Try our night tournament customizer. 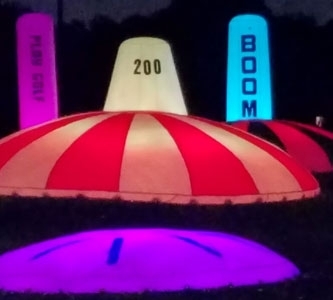 It's easy just enter the number of players, holes, glow level and we will display the recommended products for a successful glow golf event! 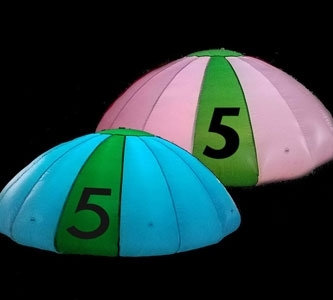 Night golf made easy, select the number of players, holes, glow level and we will recommend a package for your event. Each selection is customizable. 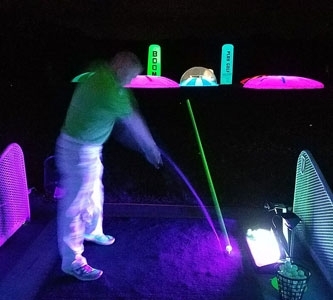 Night golf was developed as a fun, innovative way of furthering existing player’s game, and for a down right good ole’ time. Let’s face the facts - there are twice as many night time hours as there are day time, which makes night time golf the perfect addition to any country club or golf course. Extend the limited hours available for golf every day by replacing those night time hours with revenue generating night golf! 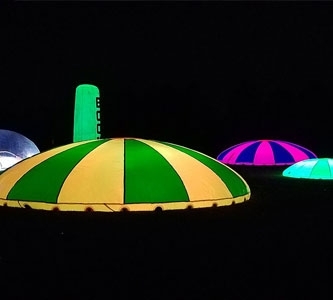 Organizing a night golf tournament for fun or fundraising has never been easier. Take advantage of our innovative night golf package creator. Choose your budget and number of holes/players and your recommendations will be displayed. Easily customize the package by updating the quantities to best match your needs. 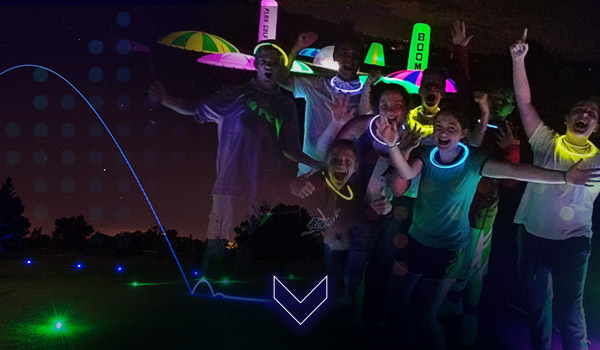 Outline the fairway with 6" glow sticks - one on each side every 25 – 30 yards. Give each player a night golf ball. The golfer with the furthest or straightest drive wins! (Make sure the beverage cart is nearby for additional FUN). You thought the hole-in-one contests for a new car were tough during the day time. Elevate the experience to a whole new level. 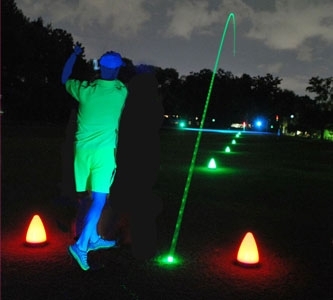 Hold the hole-in-one contest at night, using our wide selection of night golf supplies. Purchase hole-in-one insurance to cover the chance to win a million dollars or a new car! Sounds easy eh? Choose the hardest green on the course, add some glow golf balls, flashing distractions, darkness and you’re set. Adhere our led necklaces to the flag stick, outline the green using 12" glow sticks, and coil up a couple of glow necklaces and insert them into the cup. The person with the closest putt wins! Bend the Fat 1.5” glow stick and shake. Insert the glow stick into the end opposite of the area marked with ‘S’, paying close attention to make sure it’s centered. When hitting the glow golf ball, make sure you hit the ball parallel to the glow stick. You can easily replace the glow stick by using a golf tee. Disclaimer: Never hit our glow stick golf balls with drivers. The use of some drivers with our glow stick golf balls could damage or dent the faces. Activate the camera light on any smartphone and touch the printed black circle. Upon sensing the light, the ball will illuminate until turned off. Make sure to turn off the ball by touching the printed black circle using any smartphone camera light. LED golf balls have no disclaimer and can be used freely with any club on the market. As a safety measure, each player or person on the course should wear a glow necklace or similar device so golfers are aware of where everyone is. Remember safety first! It’s dark outside and visibility is low. Insert tee box spike ball markers or place 6” glow sticks on the ground. Bend and activate the 6” or 12” glow sticks (depending on your custom package). Place one of the glow sticks on each side of the fairway every 25-35 yards. Choose green for in bounds areas and red to mark hazards. Outline the green by placing or inserting the activated glow sticks using your choice of color. Using a coiled up 22” glow necklace, you can drop it inside the cup and it will adhere to the sides. Alternatively, you can use a glow badge and adhere it to the side of the cup using the sticker located on the back. Attach the led necklaces or 12” glow sticks to the flag pole using tape.